Bears have been sighted throughout South Carolina. If you see a bear and would like to report a sighting, please use the web-based reporting form, developed by the S.C. Department of Natural Resources (DNR): www.dnr.sc.gov/wildlife/bear/sightingform.html. 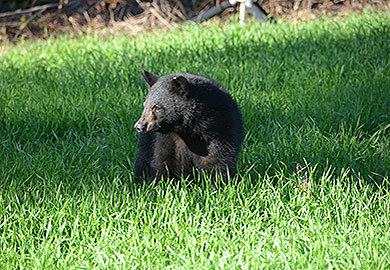 Sightings are recorded and used to aid in black bear management. No feeding: A bear that becomes accustomed to having food provided is an accident waiting to happen; don't feed a bear the first time and it will likely leave the area soon. No garbage: Keep garbage in tightly shut or bear-proof trash cans; garbage left in the open, in an open dumpster, or in the back of a truck is an open invitation for a bear. Pet food storage: Store pet food properly if kept outside; put pet food in airtight storage containers and don't leave leftover food out in the open. Clean grills: Keep charcoal and gas grills covered and clean to keep food odors from attracting bears. Bird feed and feeders: If a bear starts getting into your bird feeders—and they will if given the chance—take the feeders down and put them away for a while; the bear will move on quickly. Or install the feeder on a rope or cable so it can be raised and lowered. Beehives: If you're going to have beehives in bear territory, protect your investment with an electric, bear-proof fence. For more about black bears in South Carolina, including "A Homeowner's Guide: Living with Bears," visit www.dnr.sc.gov/wildlife/species/bear.html.